The Gamma Beta Phi Society, a national collegiate honor society, was chartered on March 22, 1964 in Spartanburg, South Carolina. 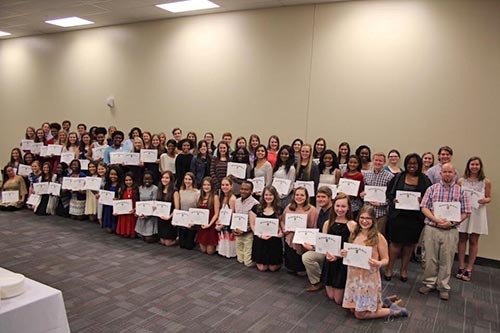 Created by a group of Southern college educators, it was a natural extension of the Beta Club, a high school honors society founded by Dr. John W. Harris. Dr. Harris served as the Society’s Executive Secretary for its first decade. Under the tutelage of the next Executive Secretary, Dr. Aaron Todd, the Society grew steadily, adding new chapters and moving to Murfreesboro, Tennessee. In 1984 Mrs. Margaret McCauley became the new National Executive Director, a position created to better serve the Society in a leadership role and in tandem with the National Executive Committee. Under her leadership, the Society continued to experience growth and success, as thousands of members across the country found ways to impact their local communities through community service initiatives. In 2017, National Headquarters relocated from Oak Ridge, TN to Knoxville, TN in an effort to accommodate the Society’s growth and continued success. Soon afterwards, Mr. Craig Pickett Jr. was appointed as the National Executive Director of the Society. Under his leadership, the Society will continue to focus on the pillars from which it was established – promoting the highest levels of scholarship through academic success, serving as a catalyst for civic engagement through community service (locally, regionally, and nationally), and promoting character development through servant leadership. Today, Gamma Beta Phi has chapters at community colleges, liberal arts institutions, and private/public research institutions across the United States. It regularly inducts thousands of academically successful students who share its mission of promoting education and service. The Society’s emphasis on post-induction community service distinguishes it from the vast majority of collegiate honor societies and scholastic associations. Furthermore, the one-time national fee of $70 serves as one of the lowest in the entire nation for collegiate honor societies. Although each chapter spends time focusing on the needs of their local community, the Society continues to leave a long-lasting impact on the nation through our annual/national service project. In recent years, The Gamma Beta Phi Society has collected thousands of books for St. Jude Children’s Hospital, sent six thousand pairs of shoes to the citizens of Iraq, collected thousands of hats for the Heavenly Hats Foundation, sent letters to the service men and woman onboard the USS Kitty Hawk, and bought an Ark for Heifer International. The current national project, The Little Free Libraries, focuses on nation-wide literacy and access by collecting thousands of books and financial resources for neighborhoods that lack public libraries. The Gamma Beta Phi Society is proud of its history of service and academic excellence and we would love to have you help us in our endeavors!